Easily remove the steering wheel in your Mustang with this easy to use steering wheel removal tool! If you work on cars and trucks long enough, sooner or later you will run into a need for a steering wheel puller. This tool is necessary for removal of the steering wheel without damaging the steering wheel or steering column. Simple operation is achieved by screwing the correct attaching bolts into the Steering wheel hub, and cranking down on the center drive shaft to apply pulling pressure to the hub. 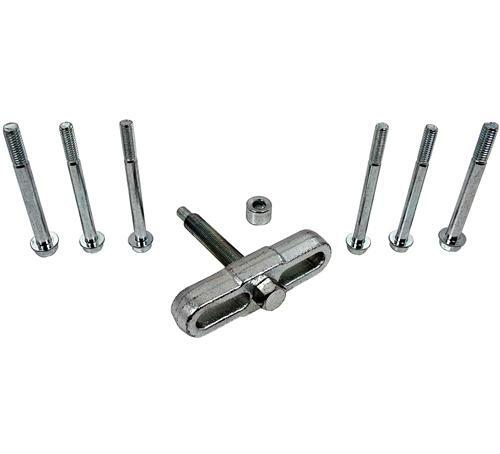 Kit comes complete with 3 sets of attaching bolts with different thread pitches and sizes to fit all standard & most metric automotive steering wheel applications. The 5.0Resto replacement steering wheel is manufactured around a new frame and NOT a remanufactured or recovered core. It mimics the factory look and feel with a synthetic leather material stitched closed with high quality, black stitching. You must reuse your cruise control switches, air bag and horn buttons. However, if you’re looking to freshen up those horn buttons as well, you can pick up a set over at LMR.com.